Every family has their own ideas about optimal child spacing, and every age difference between siblings comes with its very own set of advantages and disadvantages. Are you pregnant again soon after giving birth, and wondering what that will be like? Or are you thinking about trying to conceive again quickly after? If you belong to either of those two groups, you are not alone by any means. 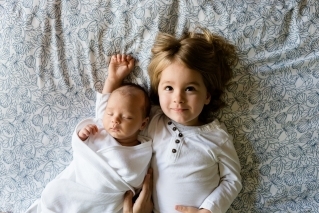 What is it really like to have babies very close together? People and by people, I mean total strangers on the street are always commented on how I had two kids very close together, when we are all out and about together. I don't think so myself. My daughter was almost two and a half when my son made his entrance into the world, so it was not like I got pregnant again months after having a baby. A friend of mine found herself expecting again when her firstborn was only three months old, though. The kids are a year apart. There are plenty of advantages to a scenario like my friend's. If the two kids' characters match well, they will have a playmate to share life with. In some rare cases, they even get to attend the same class at school. Having two kids very closely together might mean that you are essentially pregnant for a year and a half, and that can take its toll on your body (who has the time to fit in a postpartum exercise routine with two really small ones?). Pregnancy might be a tall order when you are also taking care of an infant... But at the same time, it also frees you up to pursue your career sooner than if you had a second baby years after the first. What is having two babies very close together like? A lot of hard work, just like any other age-space scenario. But it can also be a lot of fun, and it can be right for your family! Ultimately, unless you get pregnant by surprise, the decision is all yours to make. Also see, when after childbirth can you start trying to conceive again? When after childbirth can you start trying to conceive again? Pregnant after 35 - what are the benefits? Do i have to go for a check up before i conceive again? Clitoropexy surgery and post op? Can You be pregnant after an abortion and taking the Plan B EC?